The Shadows of the Apt has been one of my favourite epic fantasy series of recent years. While it has had a few ups and downs over the ten volumes it has maintained a reasonably consistent quality and I think Tchaikovsky’s writing and characterisation has improved significantly since the first book. I was looking forward to this, the final book, especially after the ending of the previous book had set up some intriguing cliffhangers, although I was slightly nervous about how many plots would have to be resolved in a single volume. I think the final book offers a satisfying conclusion to the series that manages to provide good resolutions to the various story arcs that have been running through the series. I think the bittersweet tone of the ending where successes have often come at a very high cost works well, particularly for a series which while never feeling all that grim still didn’t shy away from the high cost of war and conflict. I think there are some downsides, the pacing of the series has always been a bit erratic (sometimes too fast-paced, sometimes getting bogged down in subplots) and the problem reappears in the final book. Some of the plots such as Che’s attempts to fight the Centipede-kinden who are the final book’s main antagonists work better than others. Some events that might have had more time spent on them in previous books get dealt with very briefly and some of the cast don’t seem to get much attention paid to them. In the latter category there are both major characters from previous books like Tynisa, who doesn’t do much for most of the book even when she’s present in scenes, and also significant new characters like Ernain who plays an important role in the conclusion to one of the plots but it feels like we know very little about him. There are so many things happening and such a large cast to follow that there doesn’t seem to be as much character development as in the some of the best books in the series (such as The Scarab Path or Heirs to the Blade) although there are some good character moment (Stenwold’s return to the city of Myna where he began in the prologue to the first book is particularly effective). One of the book’s strongest points is its main antagonists; the malevolent civilisation nicknamed The Worm. The previous book had featured a number of dire warnings about how horrific they were and now that we finally see them on page they live up to and exceed those warnings. They are conceptually horrifying as well as being plausible and deadly (but not invincible) enemies and because they’re so horrific it does allow some interesting questions about what sort of acts would be justifiable when facing such a threat. It does seem appropriate that the final book in the series should feature a bigger threat than any of the previous books and while the Wasp Empire were very effective enemies, the Worm are a completely different level of threat. Another of the series strong points has been showing how the development of technology can change civilisations and the final book is taking this to its logical conclusion, showing both the positive and negative effects. It’s particularly interesting when showing how the Wasp Empire’s attempts to mould itself into an effective fighting force has paradoxically begun to bring some positives changes to its ultra-conservative society. While that part of the world-building has obvious correspondences to the real world there’s also some good exploration of the long-running contrast between the Apt and Inapt peoples and their mutual incomprehension of the other side’s mysticism and technology. 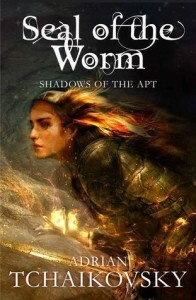 The Worm, as a force that negates both those things seems a very appropriate villain for the final book. Overall, I’d say this is a good although occasionally flawed conclusion to a good but occasionally flawed series. Although the ending of the book doesn’t demand any sequels there still seems to be plenty of potential in the world for further stories and I’d definitely be interested in reading more books set in this world.